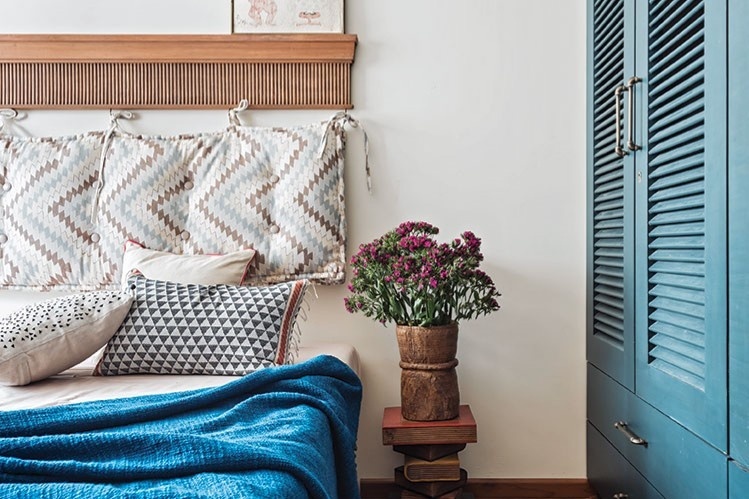 From cabinet hardware to book stacks to photo arrangements to vases filled with fresh flowers— not a single detail is overlooked in this residence, located in the Wadala area of Mumbai. That is by design. “Attention to detail makes all the difference in an interior space. Good design maximizes even the smallest features,” says Priyanka P. Mehra, principal architect at PS Design. Mehra and her design partner, Piyush Mehra, lead their Mumbai-based architecture and interior design firm. Mehra notes that most designers ensure flooring, finishes, and fabrics work together as a whole, yet it’s the finer features that enliven a design and reveal the hand of a design professional. “It’s the sofa cushions that link the fabrics used in a room. It’s wall art that reflects colors in the rug to make an impact. It’s the door handle that finishes the door,” she says. Because of the high level of professionalism and keen eye for detail so evident in her work, the owners of this residence engaged Mehra’s firm for their project. The homeowners, a couple with growing kids, had already lived in this residence for ten years; the increasingly cramped space was ready for a renovation that would accommodate their family and frequent entertaining. When the couple approached Mehra about the project, they asked her to use their vibrant home place, Goa, as inspiration for the design. Located on the western coast of India, the state of Goa faces the Arabian Sea. Tourists flock to the area, famous for its scenic beauty and mix of architectural and cultural influences. Goan homes are known for their handmade cement tiles and rustic wall finishes accented by colorful fabrics and accessories. Here, geometrically patterned floor tiles in shades of gray are complemented by lime-plastered walls in similar shades, which appear roughly finished. Bold colors stand out against these neutral backdrops, with a sofa covered in teal raw silk and accented by a collection of throw pillows. Magenta and blue throw rugs draw the eye down to the tiles. Pops of gold, orange, and coral show up in artwork, lampshades, and chair upholstery. The color riot continues throughout the home, as in the master bedroom with bedding and drapes in shades of orange and gold. Every inch of space is utilized in this small home. A shelf near the living room ceiling is bursting with books. A corner is made useful with display shelves in a spot that could have been easily overlooked and underused. In the children’s bedroom, built-ins and a thin shelf suspended by rope keep the toy collection under control. The kids also get to enjoy a feature wall covered in colorful squares of purple, blue, orange, and yellow. Against that wall is a desk area with more cubbies and hideaways for books and even more toys. The home bar delivers another study in detail and a judicious use of storage. Upper cabinets and shelving house a collection of glasses and spirits. Custom, handmade copper tiles line the walls around the upper cabinets and offer printed promises that “every empty bottle is filled with stories.” A blue-onyx counter top serves as counterpoint to the copper tiles, while square turquoise knobs stand out against the neutral cabinet finish. Family photos and mementos grace the walls above the banquette in the kitchen. The children’s bedroom is the most colorful room in the house, with bright colors adorning the wall behind the desk and storage cubbies that corral books and toys. For this home, those scouting expeditions unearthed antique louvered doors in a peacock blue, which are now used to conceal storage in the guest bedroom. An antique mirror framed in brilliant orange adorns a wall in the master bedroom. Even new items, like the wooden trunk and side tables used in the living room, were chosen for their rustic and antique feel. A Tanjore painting represents an art form dating back to seventeenth-century India that relies on vivid colors and religious iconography. A Gond painting, an Indian tribal art form, decorates the guest bath. The subjects of Gond art focus on folklore. As featured in Home By Design® Magazine. Information deemed reliable but not guaranteed. All measurements are approximate. ©2019 By Design Publishing. All rights reserved.